Let me first say that I am okay with David Alpay starring in every Hallmark Christmas movie. He’s got a wiry nerd cool that other nerds might find attractive, say other nerds who sit at home and watch TV all weekend (okay, me). I’m working backwards from 2017, so this is the third jingle bell I’ve seen him in, the others being The Mistletoe Inn and Sleigh Bells Ring. He’s charmed me every time even when the movie hasn’t. The man always talks and acts two steps ahead. Normally, I’d characterize that as being a jittery chipmunk, but he betrays an intelligence and earnestness that is alluring. Plus he’s closer in type to the guys who talk to me, so there’s that. 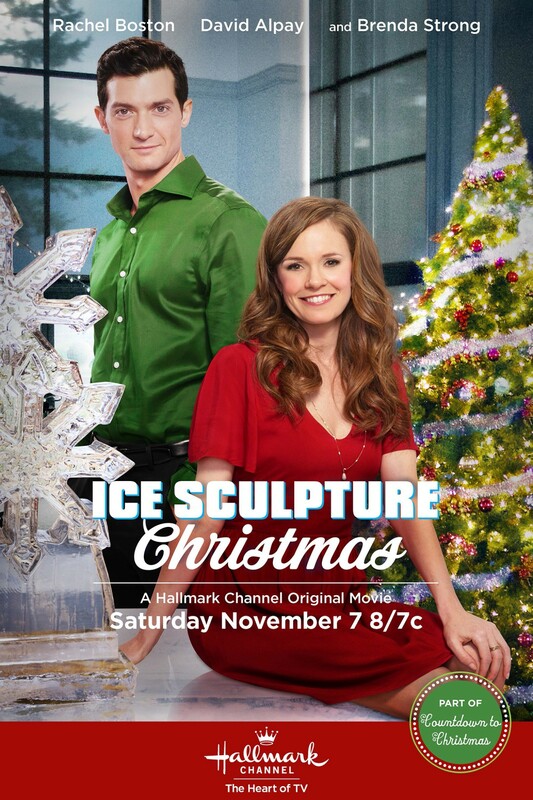 But back to ice sculptures and Christmas. Is there a profession or hobby Hallmark won’t touch? No. Whether it’s the lucrative holiday hat trade or the tastier cookie business, they’ve got you covered. And if you’re waiting for the spotlight to shine on the underappreciated poinsettia market, just hold tight. There’s bound to be a Poinsettia Christmas one of these days. As far as this niche pastime is concerned though, it offers some nice ice art to admire if you aren’t into the story. Thankfully, the story is enough to sustain its one and a half hour run time, and it gets a boost from a nice ensemble cast. Teamwork is key here. Ice Sculpture Christmas delves into the inner workings of a fancy hotel. There’s the ownership and management, which includes David (Alpay), his stern father, and his ambitious friend (Aliyah O’Brien), and then the downstairs crew, consisting of Callie (Rachel Boston) and her father (Paul McGillion), who is the house manager, and the kitchen staff. As the holidays near, they all must come together to pull off a festive Christmas. One of the highlights of the celebrations is the ice sculpting contest. Recent culinary school grad Callie has entered the hotel ranks as a dishwasher, but she also has her heart set on the contest, something she’s longed to be a part of since she was a kid. However, she’d be going up against her new boss, chef Gloria (Brenda Strong), and, worried about a matchup, she backs out – until she realizes there’s a $10,000 prize and she can pay off her student loans, at which point we realize this is FICTION. Who has only ten grand in student loans? But since we are going along with this conceit, Callie enlists the help of her childhood crush, conquering giant blocks of ice and each other’s hearts, obviously. As a general rule, I will always cheer for characters whose guiding principle is humility, and both Callie and David never stray. Neither think themselves above their station or education. Callie enthusiastically accepts her job as a dishwasher, determined to be the best damn one that she can while learning the inner workings of a hotel kitchen. This attitude earns her the respect of Gloria and her coworkers, save a conniving sous chef wannabe on villain duty. Boston is supremely likable in her role, positive and friendly without a hint of arrogance. Likewise, Alpay gives David some welcome vulnerability. Though the character is sometimes blind to his privilege, he has no qualms about serving as the apprentice to the apprentice. In fact, he’s questioning his place in his father’s sterile business world and wonders if he can’t better use his resources outside of it. I only wish we could get a better peek into the intense world of ice sculpting. The movie gives its audience enough to skate by, highlighting a few artfully carved sculptures. But there’s no reason why Hallmark couldn’t invest more money and creativity into showcasing exquisite designs. I want lens flares and close ups; I want dazzling documentary quality footage. And what I want will never be found on Hallmark, so I guess I will take what I can get.